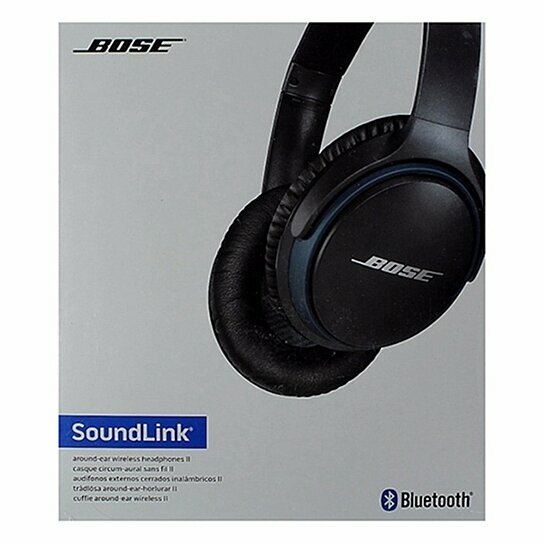 From Bose brand products, The SoundLink Series Around-Ear Wireless Headphones II. Black and Dark Blue finish. Deep, immersive sound, improved EQ-best-in-class performance for wireless headphones. Latest Bluetooth technology for easy connectivity and seamless audio/video syncs. Advanced microphone system, HD voice for clear calls in windy or noisy environments. Up to 15 hours play time with rechargeable lithium-ion battery. Switch between two Bluetooth devices so you can watch a video while staying connected to your smartphone.